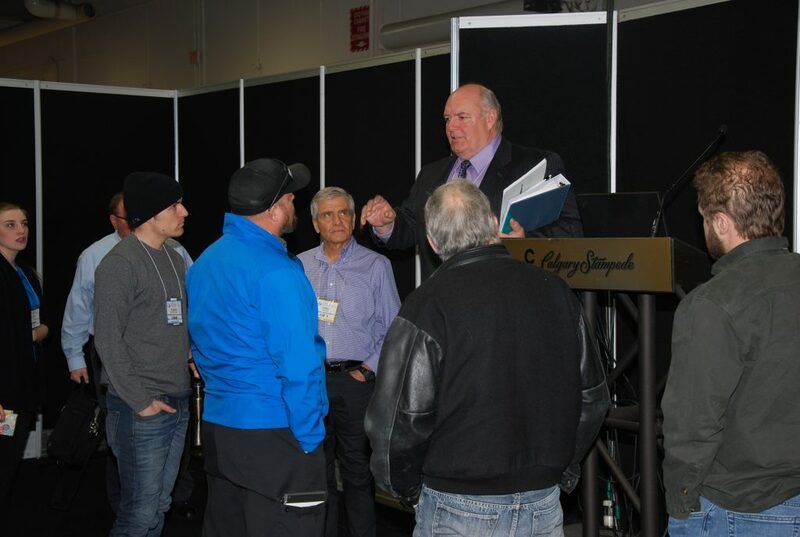 Sidney Manning, chief plumbing and gas administrator for Alberta Municipal Affairs, chats with contractors following a seminar on plumbing and building codes. Over 2,100 people – engineers, contractors, building management personnel and trades – attended the CIPHEX West trade show held in Calgary Nov. 7-8. “It’s been a good show; there’s been lots of traffic,” remarked show chairman Austin Roth, who in his day job works for Wolseley in Calgary, from the show floor on Day 2. Most visitors came from Alberta, but they also came from British Columbia, Saskatchewan, Manitoba, Nunavut, the Northwest and Yukon Territories, Ontario and Quebec. Seminars and workshops were also well supported with a total attendance of more than 600, reported Elizabeth McCullough, general manager – trade shows, for the Canadian Institute of Plumbing & Heating (CIPH), which organized the event at the BMO Centre. In a post show survey of visitors, 77 percent said they planned to purchase new products they saw for the first time at CIPHEX West and 68 percent said they plan to purchase from new suppliers they met at the show, she reported. Air Conditioning and Refrigeration: ESP Series variable speed heat pump by Hi-Velocity, Energy Saving Products Ltd.
Controls and Instrumentation: Smart System, HeatLink Group Inc. The next CIPHEX West trade show will take place Nov. 4-5, 2020 at the Pacific National Exhibition (PNE) in the Pacific Coliseum. “We are excited about this new venue; located outside of downtown Vancouver and with plenty of parking for attendees,” said McCullough.